I'll be honest, I was never really into all of that heavy contouring that has been all the rage in the make-up world over the past few years. Mainly because I'm not the most talented at make-up, so when I try to contour it sometimes looks like I just have a line of mud on my face, but also because I think make-up should enhance your skin, not cover it up. 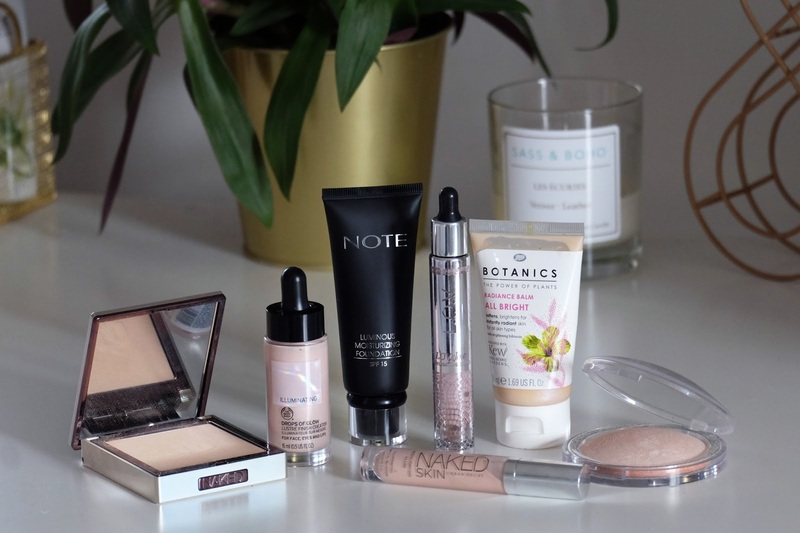 In the last few months make-up brands have really started to focus on achieving a natural, glowing look when it comes to our skin and personally, I'm all about it! Today I wanted to share with you my favourite products for getting a really lovely glow, and trust me, they will make your skin look like you've had 10 hours sleep! 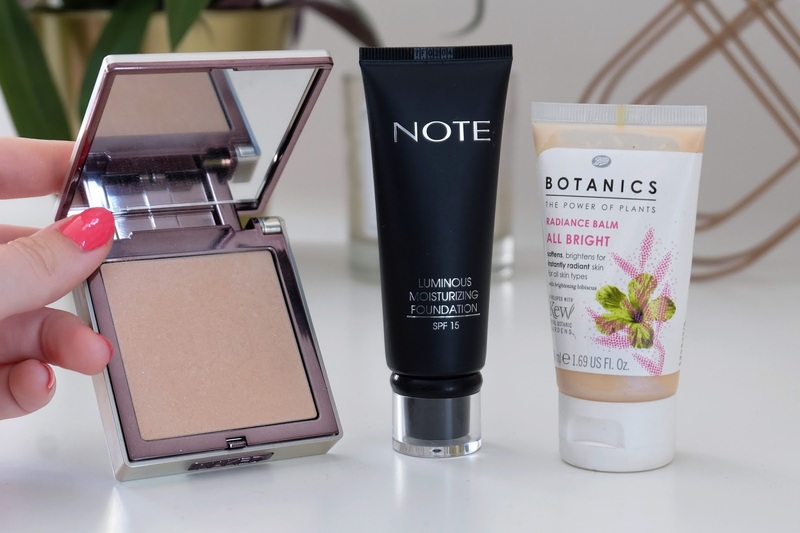 This type of product is something that's very new in my make-up bag but it's one that I think makes the most difference in the glow of my skin. 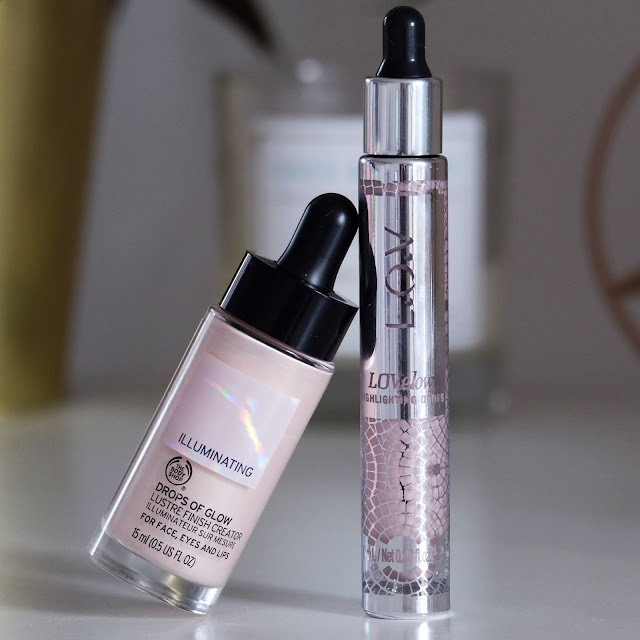 Pretty much every make-up brand has brought out a variation of these highlighting drops and I love them because they can be used two ways. The first way I use them is to mix them in with my foundation, and I find them especially good if it's a super matte foundation that can leave my skin looking a little flat. The second way is to apply them directly over your foundation on the areas you want to highlight. They're really good if you don't like a super intense highlight, but want more of a subtle glow. 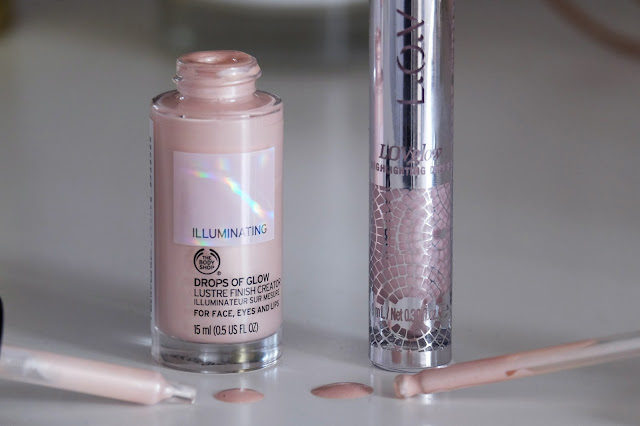 My two favourites are The Body Shop Drops Of Glow and the L.O.V Highlighting Drops. As you can see from the swatches above, both products are very easy to blend out and they don't change the consistency or finish of your foundation. The Body Shop Drops Of Glow (on the left) are a slightly less pink shade, so would be perfect for anyone with a more yellow skin tone and then the L.O.V Highlighting Drops (on the right) in the shade 010 - Moonlight Dream have a pinker tone to them. 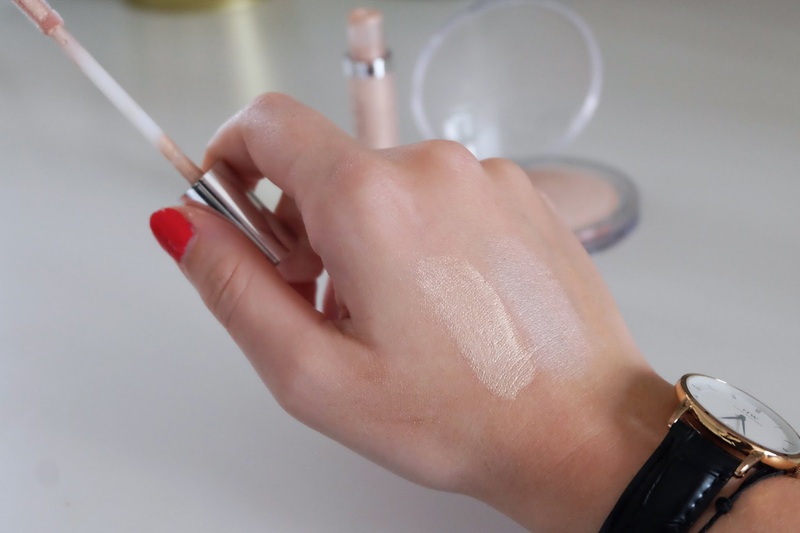 Of course I couldn't talk about glowy skin without mentioning highlighter! 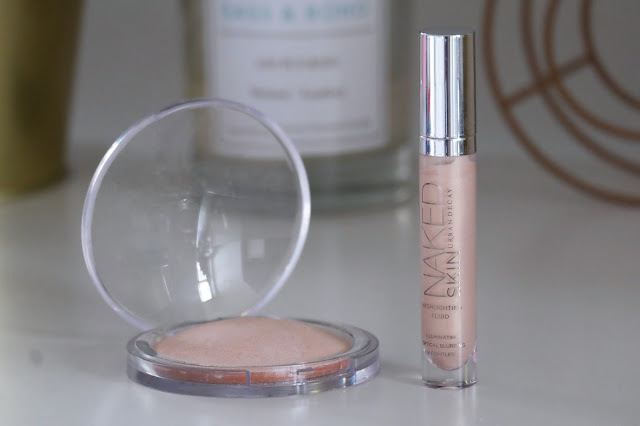 The two highlighting products that I always keep in my make-up bag are Catrice's High Glow Mineral Highlighting Powder (which only costs a fiver) and the new Highlight Fluid from Urban Decay in the shade Sin. 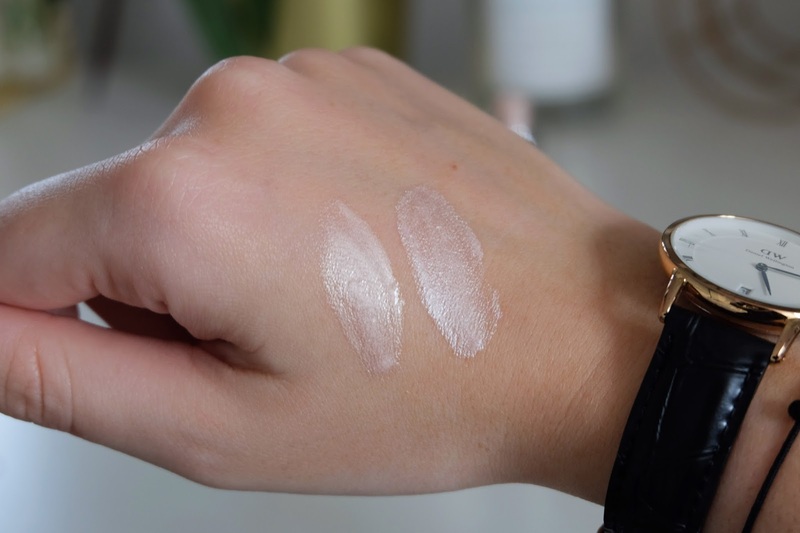 The Highlight Fluid in Sin (the left swatch) is a gorgeous champagne shade and glides onto the skin so easily. I like to use a beauty blender to blend it out once I apply it to my cheek bones and it gives the prettiest glow to my skin. To apply the Catrice High Glow powder I use one of those fancy fan brushes that all the MUA's tell me to use (I wouldn't have a clue otherwise and would probably apply it with my finger) and dust it onto my cheekbones. These products don't really have their own specific category, but they're too good to leave out, so here they are! First up is the new Urban Decay The Illuminizer Powder. This is a setting powder with a difference since it has tiny synthetic white sapphires in it which help to give the skin a gorgeous soft-focus effect. Whenever I'm feeling lazy with my make-up but still need a bit of radiance to my skin, I dust this all over my face and the difference is amazing. Another product that I've been loving to help my skin look more radiant is the Note Luminous Moisturizing Foundation. Now usually I'd steer clear of any foundation that promises to be moisturising as I have quite an oily T zone, but this foundation left my pleasantly surprised. It's lovely and lightweight, and leaves my skin really glowy and fresh. Finally is a product that has been a staple in my make-up bag for years now. Forget Mac's Strobe Cream because this All Bright Radiance Balm from Boots' own range, Botanics, is just as good and a hell of a lot cheaper! I often wear this on it's own if I want a 'make-up free' day but still need a bit of help looking like I had a full night's sleep. It's also great for popping on before you apply your foundation for that 'glow from within' look. So there we have it, all the products you need to help you get 'that glow' that we all seem to be obsessed with! What are your favourite products for getting radiant skin? As always, thanks so much for reading and I hope you enjoyed this post!